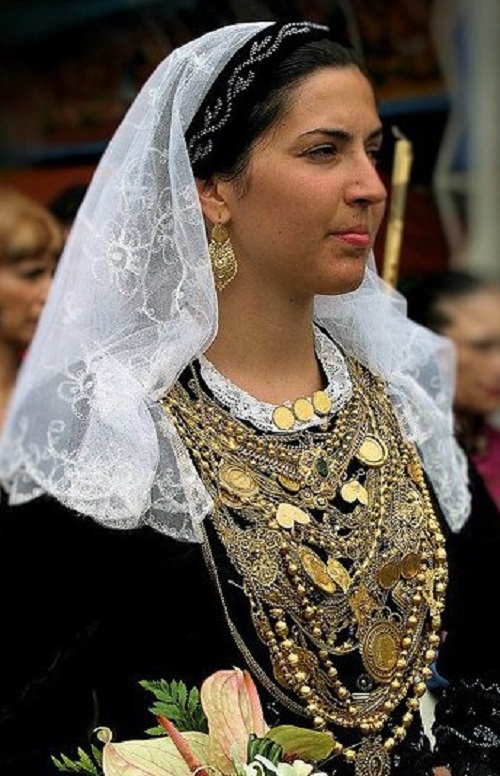 Folk dress of Portuguese woman decorated with jewelry has been always highly valued because of its superior quality and a special technique of making ornaments – filigree. The oldest objects found on the territory of modern Portugal, made in filigree, dated 2500-2000 BC. 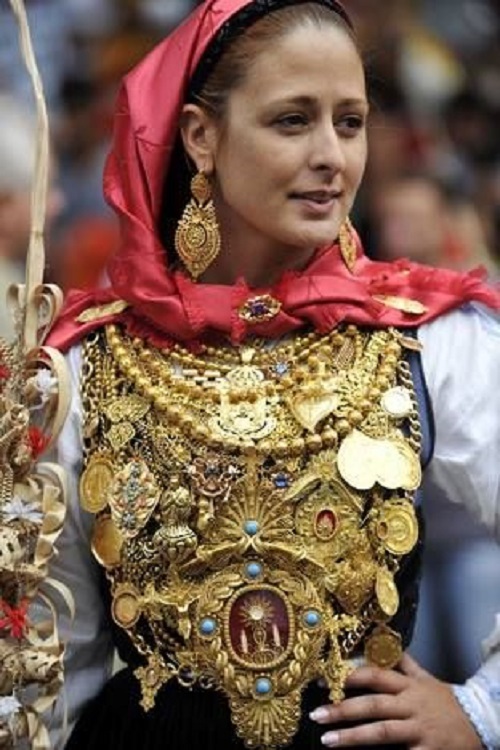 It should also be noted that the Portuguese gold has the highest purity in Europe – 19.2 carats (80% purity). 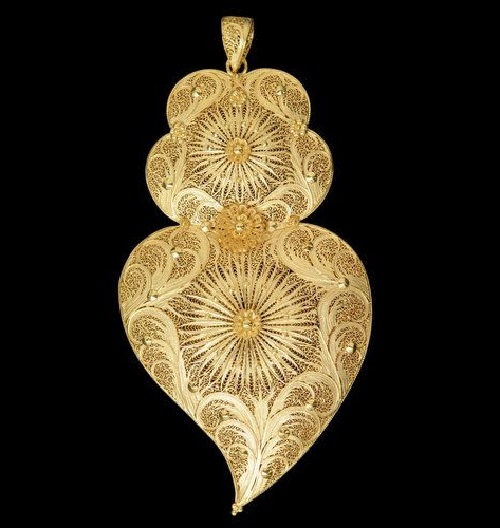 Forms and design of jewelry are closely associated with the history and religion. 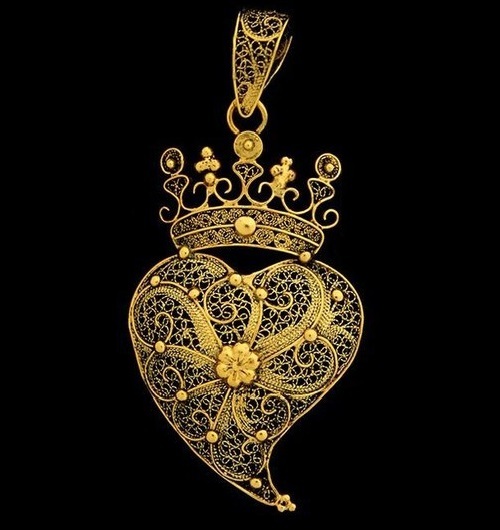 For example, the famous heart of Viana (coração de Viana), the form of which is observed in present day traditional earrings is one of the oldest symbols of Portugal. 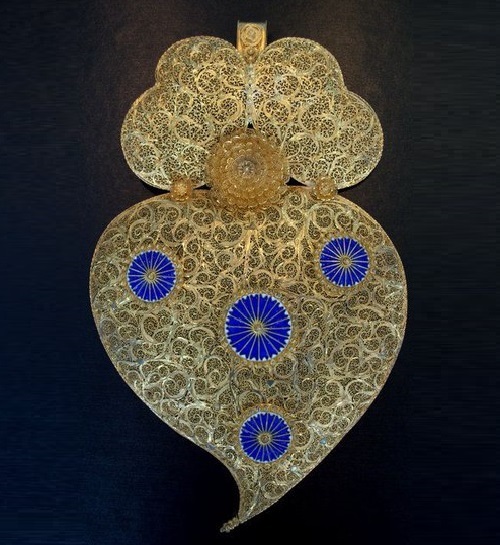 Filigree – an ancient art technique of processing metal, very typical of the Portuguese jewellery. 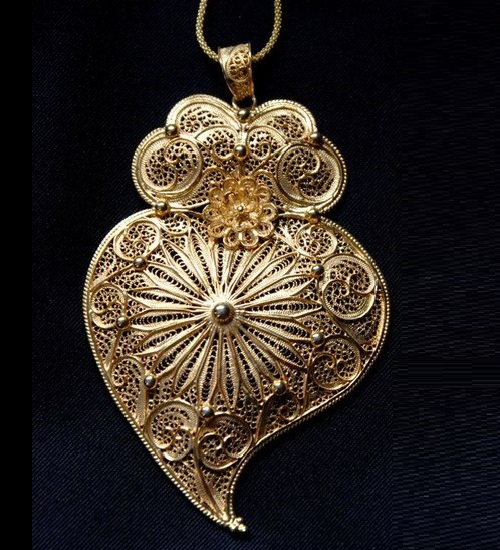 Openwork pattern of thin gold or silver thread. 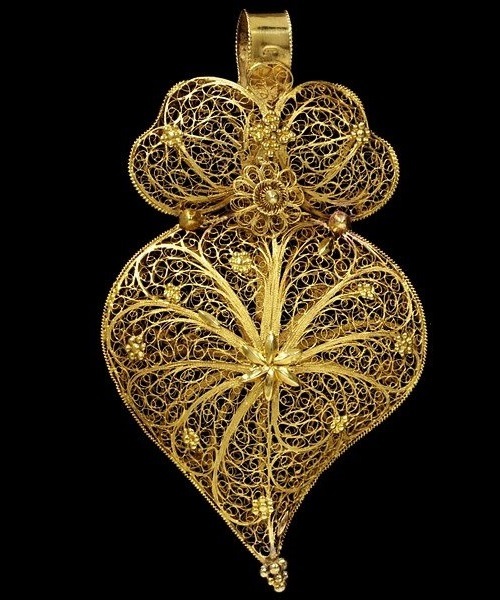 Technology is not unique to the Portuguese, its exact origin is unknown, but the oldest articles have been found in what is now Portugal, made in filigree, dated 2500-2000 BC. 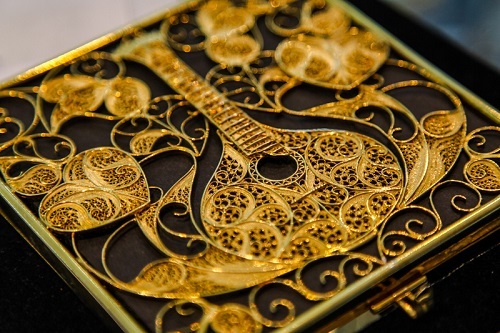 Portuguese filigree is the artistic heritage of the Portuguese jewelry craftsmanship. Each product is made in this technique – a little unique work of art. 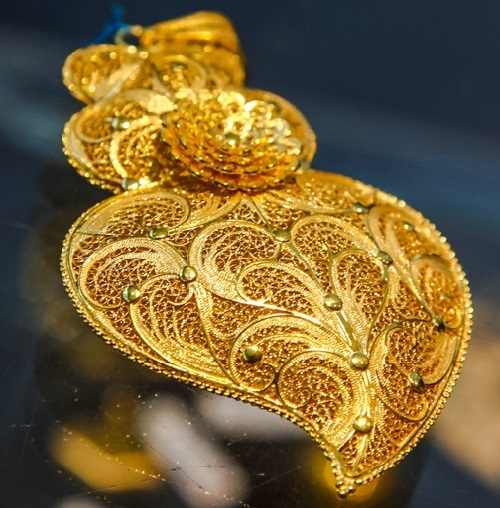 Some signs point to the fact that the Portuguese filigree was born in the north of the country, in the cities of the province of Minho, in particular in the cities of Póvoa de Lanhoso and Viana do Castelo, where jewelry crafts began to develop from the time of the Roman Empire. 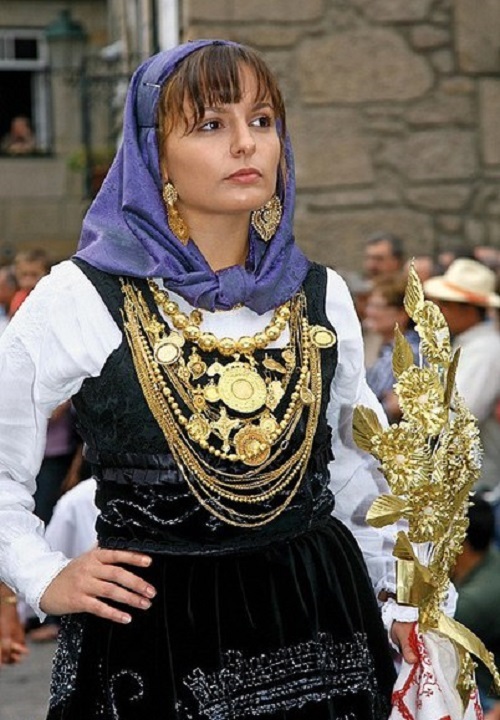 In the “golden village” of Travassos, in the north of Portugal, since 2001, is a museum of gold. 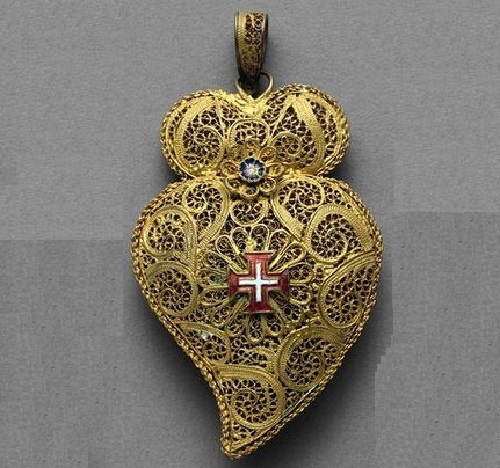 The Heart of Viana (coração de Viana) is also called the heart of Minhoto (o coração Minhoto). This is a very well-known symbol of the region of Minho in the north of Portugal, and more specifically – the city of Viana do Castelo, where it originated. The symbol originated at the end of the XVII century in the wake of the cult of Christ sacred heart, during the rule of Queen Mary I. It symbolizes love, that is so strong that the heart is full of flames. This “flame” is depicted in the upper part of the heart of Viana. 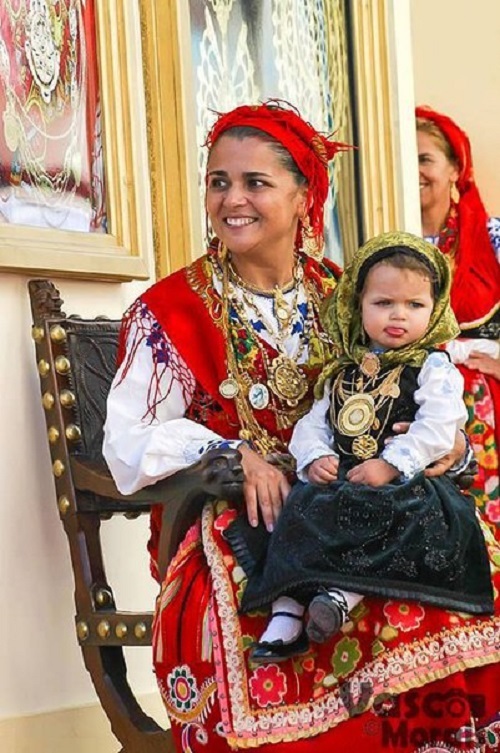 There are other popular types of jewelry, in addition to the heart of Viana – filigree rings (arrecadas or argolas), royal earrings (brincos à rainha), beads, or beads Viana (contas de Viana). 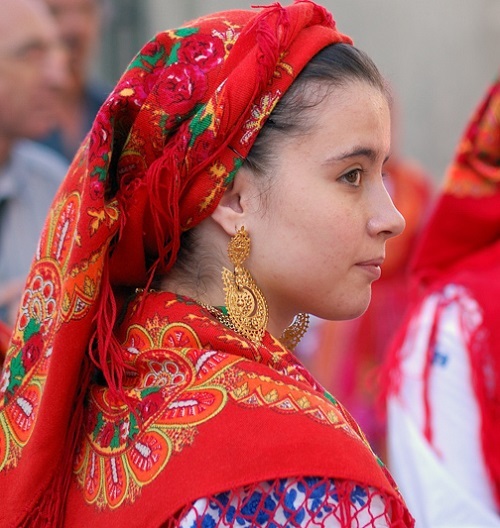 Traditionally, girls from the Minho region wore filigree earrings. It was a very important part of their attire and still is part of the folklore jewellery, passed from generation to generation. Filigree earrings are traditionally worn by women of Minho region. 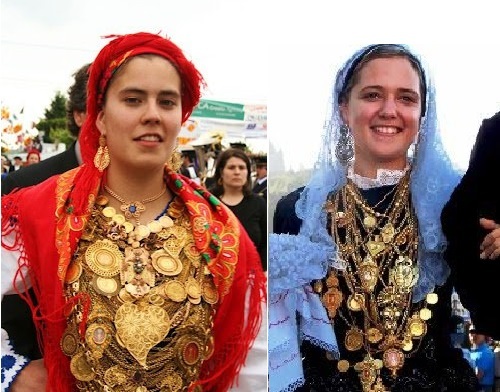 During national holidays and religious processions, which Minho is famous for, it is impossible to take eyes off the girls and women in dresses, literally shining gold. Women wear all the family gold, which is inherited. 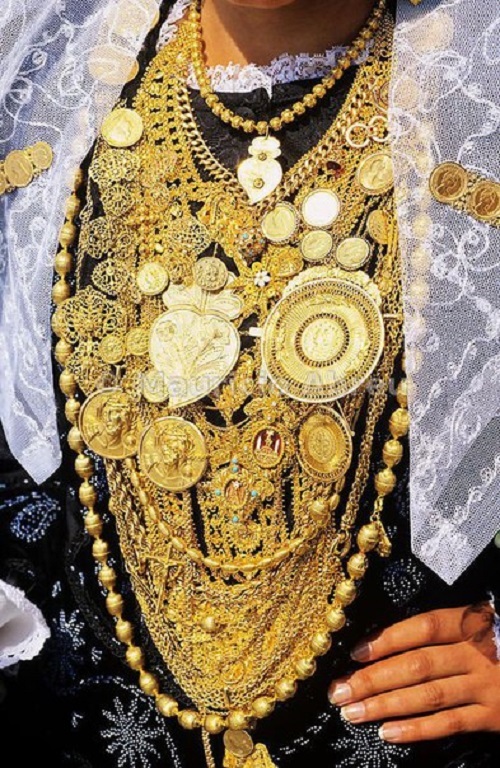 To keep the family wealth in the form of gold is an ancient tradition and is spread throughout Portugal. 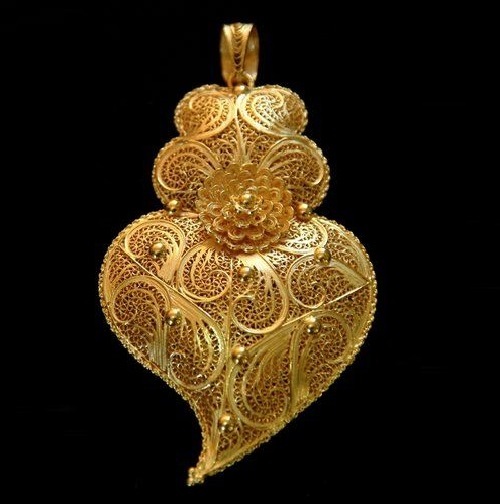 Gold from the chest of residents of Minho – a symbol of beauty, wealth, grandeur and elegance. 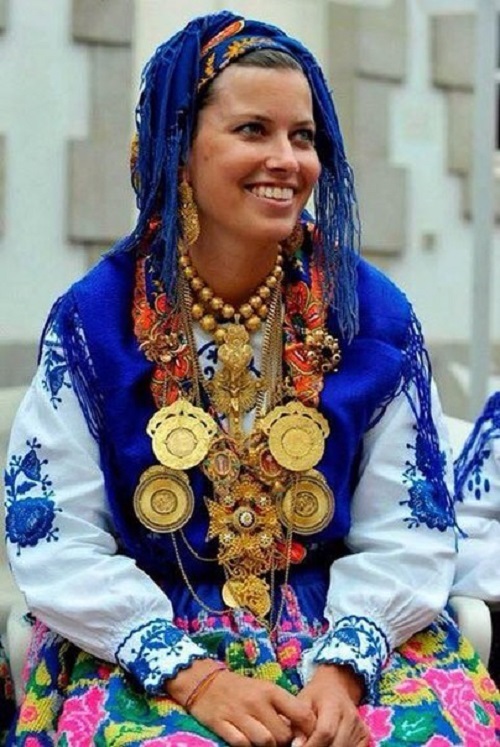 This is a very important part of their attire and still is part of the folklore. 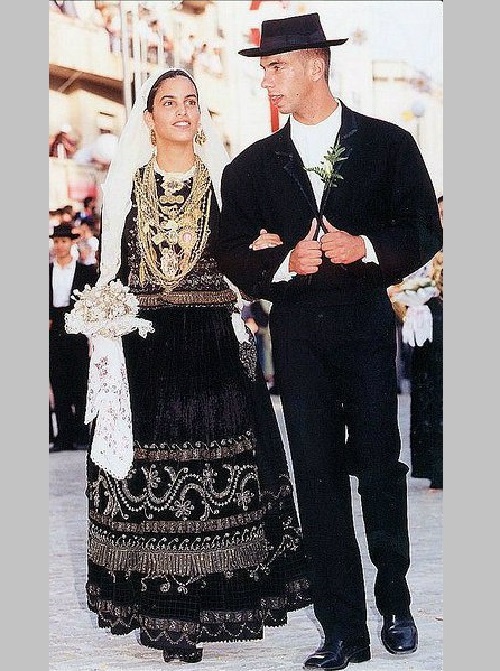 The popular types of jewelry – filigree rings (arrecadas or argolas), royal earrings (brincos à rainha), beads, or Viana beads (contas de Viana), as well as the suspension of the heart of Viana. The city of Viana do Castelo has a legend, that here, a long time ago, in the castle, lived a princess, whose name was Ana. She was very beautiful, but shy. Nobody and never could see her, except briefly in the windows of the castle. One day, she fell in love with a guy that lived across the river. He used to walk under the windows, saying: «Vi a Ana do castelo!» («Saw Ana from the castle”). He spoke it so often and loudly, that eventually the area was named – Viana do castelo. 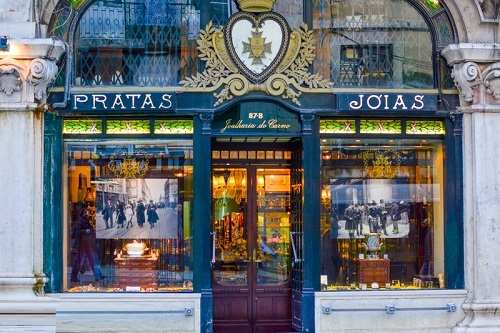 3 – Tous (Ourivesaria Aliança) – one of the oldest shops in the Chiado, which was opened in 1909. The interior of the store is considered one of the most beautiful in Lisbon. Under the brand Tous works since 2012.